My laptop is on its last legs, if the number of times it has crashed in the past month is any indication. Ever since buying an iPad when they first came out, I have been relying on my laptop less and less. If I can do something on my iPad, great. If not, then I’ll reluctantly fight with my old Dell. I was right on both counts. My computer refused to recognize the microphone, and when it finally did, it sounded like I was underwater. I didn’t want to go out and buy a new microphone because it might not be any better. On a whim, I searched the App Store for podcasting apps. One of the first results was Bossjock Studio. It looked really cool, but it also looked simple enough that even I could use it. At $9.99, it was going to be much cheaper than a second microphone. I downloaded the app and then discovered what I should have realized earlier. You can’t plug a microphone into an iPad. I checked Staples and Amazon for iPad microphones and came across a few suspicious looking splitters. Finally, I decided to try the iPad’s built in microphone before buying another microphone. I launched the BossJock app and created a test recording. The sound was crisper than anything I had recorded so far. The microphone was excellent. I was able to record myself, and the product didn’t make me sound like I was talking around a mouthful of cotton. I recorded my podcast in short segments to give myself time to breathe and prepare for the next segment. After about three minutes, I would start to lose my breath and my focus. In my first podcast, the sound was crystal clear. A little too clear. About three minutes in, I heard my dog snoring. Five minutes in, I heard a fire truck in the background. I re-recorded the podcast and then exported it as an mp3 file. I imported the file into Audacity and then used Audacity to add the intro music, transition, and concluding music. Cutting and pasting in Audacity was surprisingly easy. I probably could have edited the podcast in Bossjock, but I was more familiar with that feature in Audacity, so I used that. Hopefully, I managed to cut out most of the “Ums” and “Uhs.” I also cut out a segment that didn’t seem to fit with the rest of the podcast. I still really hate listening to the sound of my voice, but a higher quality mic made a big difference. I’m thrilled that I was able to find an iPad app that I could use for part of the assignment. The built in mic can totally make some great recordings. Also, adjusting where you aim the direction of your voice can make a big difference. The iPad mic is on the same edge as the headphone jack. 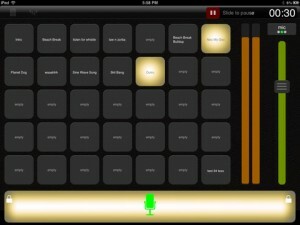 We are working up a blog on recommended iOS compatible mics that we will be posting soon to our site. Untill then there a few different external mics you might like to check out. The iRig MIC Cast is a great little mic at around $40. An absolutely stunning solution can be had for under $70. You can get the $35 Mic ATR2100 and the $30 Apple Camera Connector Kit (for 30 pin dock) or Apple Lightning to USB Camera adapter (for lightning iPads). The Apple adapter lets you connect the USB output of the ATR2100 mic to your iPad. But as you’ve found out, you can create great audio and keep the setup simple.